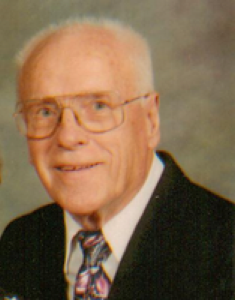 Joseph F. Wesbecher, 90, died at Dorothy Love Retirement Community, 3003 W. Cisco Rd., Sidney, Ohio on Sunday, July 19, 2009 at 2:05 AM. He was born April 26, 1919 in Sidney, Ohio the son of George Joseph and Clara Catherine (Kerber) Wesbecher and they are deceased. He was married June 14, 1941 to Rosemary F. Weaver and she survives along with four children, Tom and wife Barbara Wesbecher of Troy, Ohio; William and wife Jeanne Wesbecher of Urbana, Ohio; Beverly Boroff of Sidney, Ohio; and Mark Wesbecher and wife Jill of Bentonville, Arkansas; 13 grandchildren; 20 great-grandchildren; one sister-in-law, Dorothy Wesbecher of Sidney, Ohio. One son, Dennis Wesbecher, one daughter, Karen Cull, brothers Leo, John, Charles, Bernard and sisters, Catherine Miller and Mary Davidson are deceased. He was a 1937 graduate of Holy Angels High School. He was a United State Army veteran in World War II and served overseas. He was a member of the Sidney American Legion and the VFW. He had worked at Rich&#39;s Grocery on Highland Ave. from 1937-38; Sidney Daily News carrier from 1935-36. McClure and Wheeler Grocery on Michigan Ave. from 1938-40; Monarch Mchine Tool Co. from 1940-41 and the GMC Aero Products in 1942. He had worked at the Copeland Corp. and retired in 1983. He also worked at Gateway Pipe Supply company in Sidney, Ohio for two years. He was a member of Holy Angels Catholic Church and was an usher at the church. A Mass of Christian Burial will be held on Thursday, July 23, 2009 at 10:30 AM at Holy Angels Catholic Church in Sidney, Ohio with Rev. Dan Schmitmeyer. Burial will full military honors will be held at Shelby Memory Gardens, Sidney. Friends may call at Salm-McGill and Tangeman Funeral Home in Sidney, Ohio on Wednesday, July 22, 2009 from 4-8 PM. Memorial contributions may be made to Gifts for Yanks and envelopes will be available at the funeral home.